We are manufacturing all kinds of test chamber such as stability chamber, humidity chamber, environmental chamber, climatic chamber, salt spray chamber and walk in stability chamber. We also manufacture mortuary chambers. 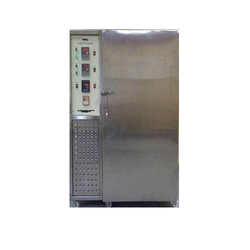 We offer the wide range of Stability Chambers to our valuable Clients. Innovative Environmental Chamber is designed for drying environment of plant and animal growth, investigation of vapor roofless of packed materials, determination of dielectric strength, insulation tests electrical components and many other tests requiring an atmosphere of control temp. and humidity. The sturdy double-walled constructions provide a pleasing get. The interior walls are made of heavy gauge stainless steel 304 grade. The exterior made of heavy mild steel finished with epoxy powder coating. The door is of massive construction having window and seals against atmospheric in infiltration by resilli asbestos and rubber gasket. 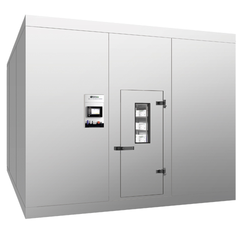 The temperature of Environmental Chamber can be controlled from 10°C. to 60°C. plus minus 2. deg C. and humidity 55% to 95°% plus minus 5% are controlled by an automatic electronic controller with digital display of temperature and humidity. Temperature below ambient is controlled by a hermetically sealed compress complete with its all accessories provided at the bottom of the unit. Two water tank made of stainless steel have been provided in the cabinet. 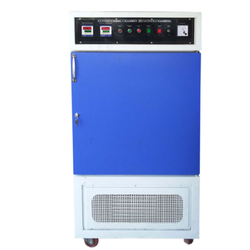 Innovative Humidity Test Chambers are especially designed to study and check the effects of different environmental parameters in respect to humidity, temperature applications tests involving micro-organism, tissues, seeds testing, biological studies, testing on electronic mechanical components, Cement plants, packing industries etc. 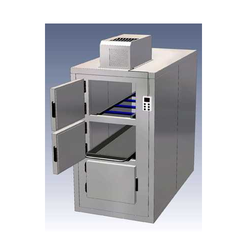 Innovative Humidity Test Chambers are Double Walled – Inner SS and Outer MS with 65 mm thick Glass Wool insulation. 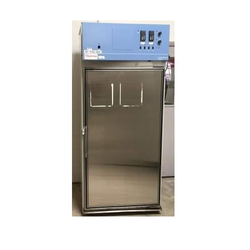 The innovative Mortuary chamber is a double walled cooling unit. The outer body of mortuary chambers is constructed out of thick steel/ aluminum sheets, painted with long lasting stove enamel or elegantly powder coated. The inner chamber is made of heavy gauge stainless steel sheet of SS-304 grade or anodized aluminum sheet or G.I. (as per the customer’s requirements). The 100 mm gap between the walls is filled high-grade poly urethane insulation, which ensures maximum thermal efficiency. The doors are connected by very sturdy chrome plate hinges and fitted with hard chrome plated lubricated latches for opening the door. The unit is provided with very sturdy castors. ISI marked high-end CFC free compressors of Kirloskar/Tecumseh make, conforming to latest international standards and guidelines used for cooling. Salt Spray Chamber has been elegantly designed to evaluate the facility of rust proofed components to withstand corrosion due to atmospheric conditions. Digital humidity indicator to display chamber humidity level. Air Regulator will maintain a constant pressure of Air. Looking for TEST CHAMBERS ?